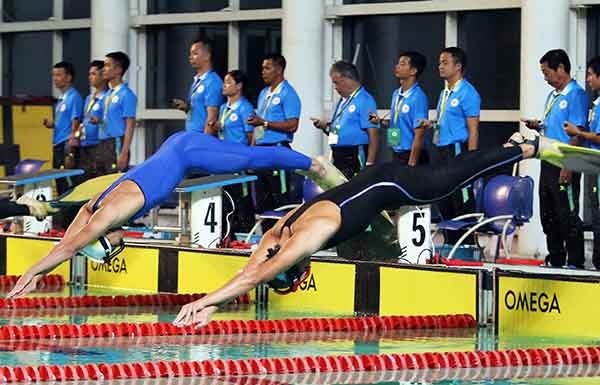 HÀ NỘI — Athletes set three national records in fin-swimming at the National Sports Games, which are ongoing in Hà Nội. 16-year-old Phạm Thị Thu of Hải Dương Province won the women’s 100m surface (diving with a snorkel) with a time of 40.62sec, replacing the old record of 41sec set by Hanoian Trần Thị Huyền Trang in 2009. The second record went to Trần Thị Trang Điểm of Quảng Bình, who won the women’s 800m surface, clocking 6min 58.51sec. Hà Nội posted their record in the women’s 400m surface relay with a time of 2min 45.21sec. Minutes later, HCM City set a Games record in the men’s 400m surface relay. They set a new mark of 2min 26.72sec. The team also bagged two golds and two Games records in the men’s 100m surface and 100m immersion (diving with an oxygen tank) by Nguyễn Thanh Lộc (35.24sec) and Ðỗ Ðình Toàn (32.87sec), respectively. The results helped HCM City top the fin-swimming rankings with three gold medals after the first day of competition on November 26. Football and table tennis also kicked off on November 26. In football, the eight men’s teams are divided into two groups. They will compete in a round robin format with the two best teams of each group advancing to the semi-finals.